3. What are the leakage points? 4. What are the solutions? 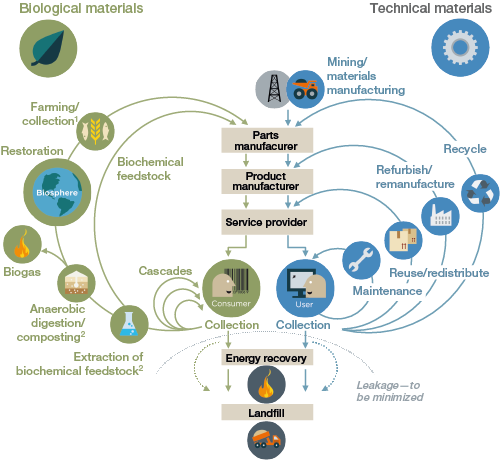 For technical nutrients, the circular economy largely replaces the concept of a consumer with that of a user. This calls for a new contract between businesses and their customers based on product performance. Unlike in today’s buy-and-consume economy, durable products are leased, rented or shared wherever possible. If they are sold, there are incentives or agreements in place to ensure the return and thereafter the reuse of the product or its components and materials at the end of its period of primary use. 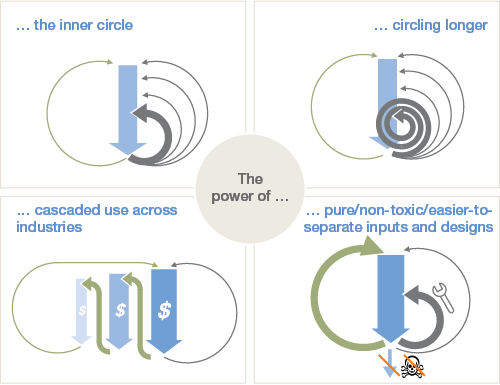 The power of the inner circle refers to minimizing comparative materials use vis-à-vis the linear production system. The tighter the circle, i.e. the less a product has to be changed in reuse, refurbishment and remanufacturing and the faster it returns to use, the higher the potential savings on the shares of material, labour, energy and capital still embedded in the product, and the associated externalities (such as greenhouse gas (GHG) emissions, water and toxicity). The power of circling longer refers to maximizing the number of consecutive cycles (be it repair, reuse, or full remanufacturing) and/or the time in each cycle. Each prolonged cycle avoids the material, energy and labour of creating a new product or component. as as when cotton clothing is reused first as second-hand apparel, then crosses to the furniture industry as fibre-fill in upholstery, and the fibre-fill is later reused in stone wool insulation for construction—substituting for an inflow of virgin materials into the economy in each case—before the cotton fibres are safely returned to the biosphere. The power of pure inputs, finally, lies in the fact that uncontaminated material streams increase collection and redistribution efficiency while maintaining quality, particularly of technical materials, which in turn extends product longevity and thus increases material productivity. 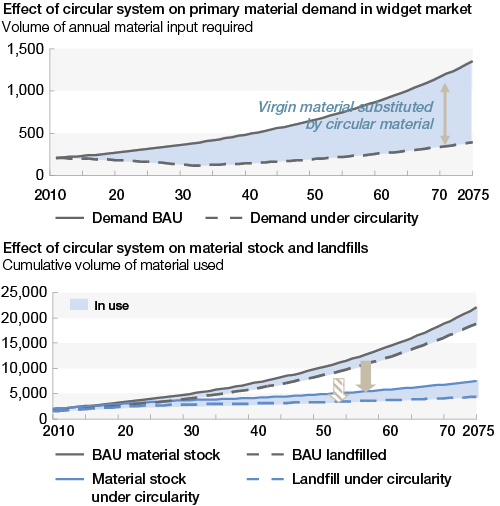 These four ways to increase material productivity are not merely one-off effects that will dent resource demand for a short period of time when these circular setups are introduced. Their lasting power lies in changing the run rate of required material intake. They can therefore add up to substantial cumulative advantages over a classical linear business-as-usual case. The two Towards the Circular Economy reports published by the Ellen MacArthur Foundation provide ample evidence that circularity has started to make inroads into the linear economy and has moved beyond proof of concept. A number of businesses are already thriving on it. Innovative products and contracts designed for the circular economy are already available in a variety of forms—from innovative designs of daily materials and products (e.g. biodegradable food packaging and easy-to-disassemble office printers) to pay-per-use contracts (for tyres for instance). Demonstrably, these examples have in common that they have focused on optimizing total systems performance rather than that of a single component. 11 More detailed summaries of the concept and principles can be found in the two reports Towards the Circular Economy 1 and 2, 2012 and 2013, Ellen MacArthur Foundation. 12 McDonough, W., Braungart, M., Cradle to Cradle: Remaking the Way We Make Things, New York: North Point Press, 2002.